Although the compost tumbler is effective in generating healthy fertilizers in a matter of weeks, you have to be sure to load the proper proportions of brown and green ingredients. Like compost bins, compost tumblers reduce the smell of compost pile. A foul odor coming from the compost tumbler is a sign of a problem. If the brown and green materials are not loaded in balanced proportions, the compost will produce a foul smell. Actually, well-balanced compost doesn’t smell. The offensive odor occurs because the organic materials are undergoing the decomposition or rotting stage. There are two bad odors that can come from a compost pile: a rotten odor and ammonia. Since both have clear and unique causes, the diagnosis and cure are easy to determine. If you find the compost pile is giving off an ammonia-like odor, it indicates that there is too much nitrogen. This usually occurs if you have added too many scraps high in nitrogen to the compost tumbler. If the moisture content of the compost pile is too high, the result will be a swamp-like odor. This not only smells bad but it can also delay the composting process, causing an even bigger problem. A quick solution is to turn the tumbler or evenly distribute the pile inside the tumbler to let the ammonia gases evaporate. Adding more carbon-rich ingredients can also neutralize the high volume of nitrogen materials in the pile. This should also serve as a lesson to keep the nitrogen-rich ingredients in balance with the carbon-rich materials in the next round of composting. Another way of reducing the nitrogen content of kitchen scraps is to wrap them with brown paper bags before loading them into the tumbler. This kind of odor may be similar to a rancid eggs or decaying vegetables. A rotten odor indicates that the compost pile has undergone the anaerobic phase of the composting process. Actually, decomposition can occur in one of two ways: with the aid of aerobic microbes and with the aid of anaerobic microbes. The breakdown of compost is quicker with aerobic microbes. This is why you should turn the tumbler on a regular basis to promote better aeration. If there is a lack of airflow, anaerobic microbes becomes activated and they break down the compost pile more slowly, generating rotten odors. This is also known as anaerobic decomposition. The rotten odor is a caused by the discharge of hydrogen sulfide which has an odor similar to a rancid egg. The anaerobic microbes also discharge smells due to their generation of methane. If you smell this rotten egg odor coming from your composter, then the remedy is very easy: spin the tumbler. Turning the tumbler on its axis helps promote better aeration and halts the anaerobic process. Check to see whether there are clumps forming in the compost pile and try to separate them to improve the airflow. There are several possible causes for compost pile odors. You may have loaded food scraps that are not advisable for composting, like meat, dairy products, fish, or grease. They not only produce a putrid smell, but they also attract animals to your compost pile. This may be less of a problem for compost tumblers because they are enclosed and elevated above ground. Another culprit that can cause your compost tumbler to emit a foul smell is its location. 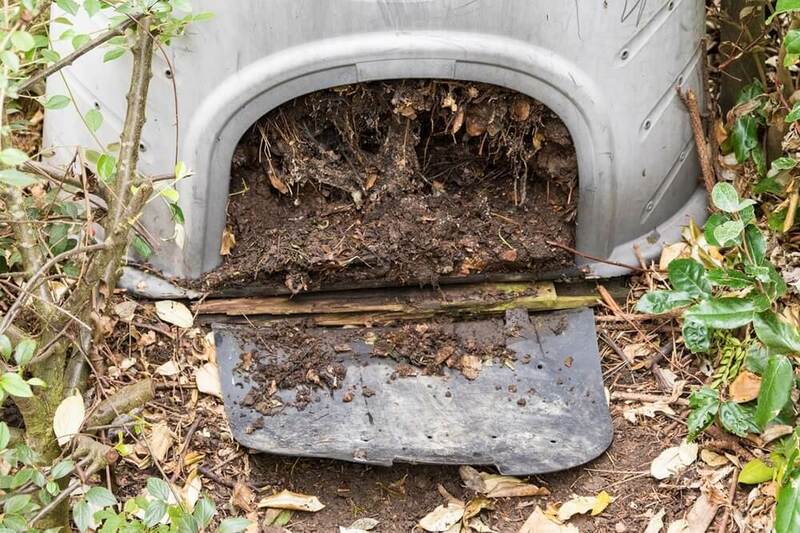 If you have placed it in an area where water runs off directly onto the composter or where it is not protected in heavy rains, then water may be the cause especially if you find that the quality of the pile is somewhat wet and soggy. Wet materials result in a smelly pile. If the pile remains wet, the aerobic microbes can’t perform their roles well. As a result, you get a rancid, putrid smell to the pile. To solve this problem, you need to turn the pile by spinning the tumbler. This will help promote better airflow so the aeration process to begin again. Moisture can also be due to an overload of nitrogen-rich ingredients. 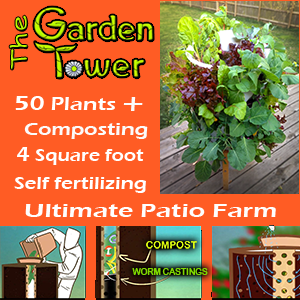 The best way to solve this problem is to aerate the compost pile by spinning the tumbler to promote oxygenation. To neutralize the ingredients high in nitrogen, add some brown materials, like wood chips, cardboard, or newspaper shreds. Don’t add any water to the pile. Your compost pile may also smell bad if you added a large pile of grass clippings from your yard. If you think that is the cause, then you can reduce the smell by adding some carbon ingredients, like dried leaves, newspaper shreds, and combine them well with the grass clippings. To avoid the problem of a smelly compost pile, there are a few composting guidelines that need to be observed consistently. One rule is to combine the right proportion of green and brown materials. An ideal ratio is 3:1, where three parts brown materials is required for every one part of green materials. Maintaining this kind of ratio protects your pile from excessive moisture. It also enhances the optimal performance of aerobic microbes. Another rule to follow is to shred the composting material into tiny pieces. Shredding leaves and kitchen scraps can lead to quicker decomposition. It also minimizes the chances of having a high moisture content. Moreover, it prevents the pile from forming into a matted mess. The last rule to observe is to turn the tumbler regularly. You can turn the tumbler once per week. If you live in cold climates, then you need to turn the tumbler more frequently to keep the compost from getting too moist. Spinning the tumbler can improve air circulation that results to a good smelling compost pile.